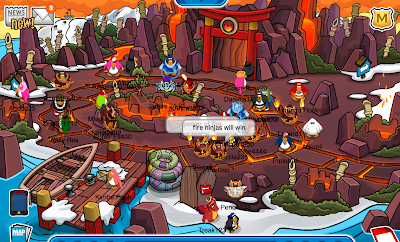 Club Penguin Cheats by Mimo777 Club Penguin Cheats by Mimo777: Club Penguin Weather Changes! That's so cool! And I love that you caught the second picture at 11:11 AM! mimo there is halloween music in the pet shop! HUH? and if you go to the dojo courtyard the rain clouds are gone but now there's snow clouds, and on the ninja hideout entrance there's a snow symbol. 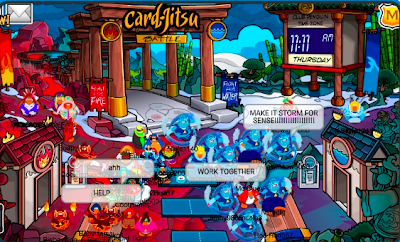 I am not joking i really saw ninja shadows at dojo 9:18 Penguin Standart time or 4:18 est you have to believe me mimo i am not joking. My name is TREX0504 and I just found out that if you go to a practice area all the players bow before they fight and theyve got a new searching for players screen. Those crazy piffles bought a jukebox while no one was looking! I'm trying to get pictures of the weather in each room. It's really hard to get other fire ninjas to dance so I can get the orange sky. It takes two to make the sky turn color, three for orange clouds and more for the fire to streak through! I really want to see the ski hill, beacon and the beach change, the sky there is nice and big. 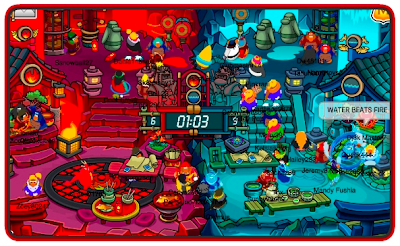 have you noticed that in the pet shop the music is from the halloween party. Unless it's just me. 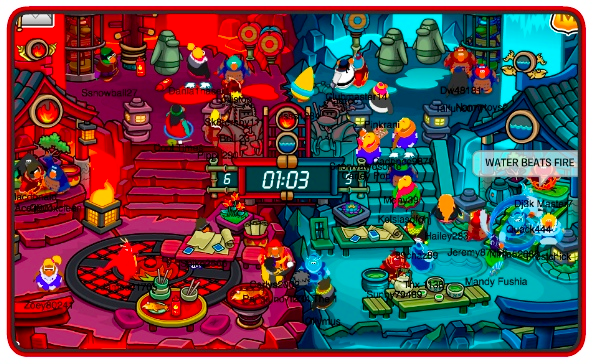 hey mimo, do you play moshi monsters or skylanders: spyro's universe? Tell me your username if you do. 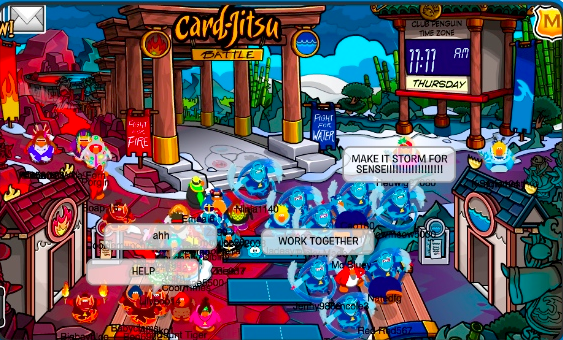 There is a new bug in CP! Log onto Snow Globe or Snow Forts and everything but you're stamps will be gone! You get them back by logging onto a different server. Mimo I just found out that if you stand in any fire pool, you will not burn! Weird?!?!!? I HAVE FOUND A GLITCH! IN THE PET SHOP HALLOWEEN MUSIC IS ON! Steal my name again and I will find you. i met sensei and added him!!! Yeah. I saw the ninjas at the dojo too. They were doing all flips of all sorts. 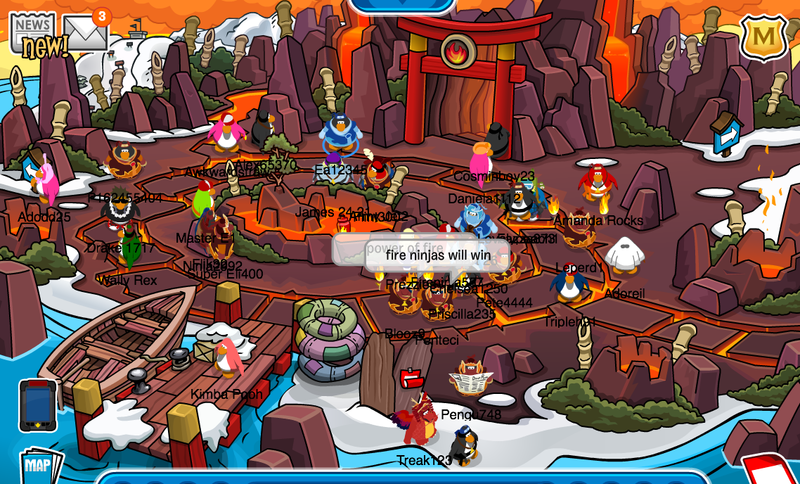 Also, if you go to the snow village house, the shadow ninja is back in the mirror. I think something big is going to happen. Like, really big.